Paella is not really one of those dishes you're supposed to be able to whip up in under 30 minutes. When I was at culinary school, my first partner was this amazing classical guitarist who lived in New York but was originally from Spain. When we were assigned to make a large-scale meal to feed a crowd, she offered to make her rendition of paella. I remember how difficult it was to get the dish together as a team. Not only did we have to figure out how to work as a team but we had to put together a dish by following the lead of someone who was not yet a trained chef... and someone who was used to making this dish with her family's very specific traditions, local ingredients and equipment. All to say that the dish didn't really turn out as planned and I remember it being a little bit of a fiasco. After flipping through one of my Spanish cookbooks that suggested making paella over an open fire using rabbit, I stared at my non-stick pan and knew I would be going the easy route. My goal wasn't going to be incredible authenticity but rather comfort, fast. Here is my rendition! In pot over medium heat, add olive oil and butter. When butter start to foam, add onion and garlic. Cook until garlic and onion soften and turn golden brown, about 5 minutes. Add rice and toast, stirring, for 1 minute. Stir in saffron and paprika. Cook according to package instructions, replacing water with chicken stock. In the meantime, in pan on medium heat, add drizzle of olive oil. Add chorizo, cook until golden and crispy, about 5 minutes; set aside. Add chicken thighs, cook until just cooked though. Stir in peas and shrimp; cook until shrimp just turns pink. Add rice and reserved chorizo; stir until combined. Stir in lemon juice. Enjoy! This looks fantastic! I love paella and fortunately have all of the ingredients needed to make it for dinner later this week. Thanks for sharing your recipe. Jan @Family Bites : Let me know what you think! It's perfect for the gloomy weather we've been getting lately! Vega: I've had different renditions of paella when traveling through Spain - my favourite combines gambas and mussels! As I mentioned, this is my quick-fix version for a weeknight meal - with saffron and seafood it still hits the spot! I remember a great road trip through Spain when we ate paella every lunchtime. We couldn't get enough of it. But we were in no condition to drive on after filling up with paella and a bottle of wine. It was straight to the beach. So our trip took quite a while. Suzanne Perazzini: I can relate - its no wonder the Spanish have a 'siesta' time booked off in the afternoon! I love your simplified version - perfect weeknight dinner! No, I wouldn't have imagined that an "easy" version of paella would be this good. Yours looks great! i love this idea so much! 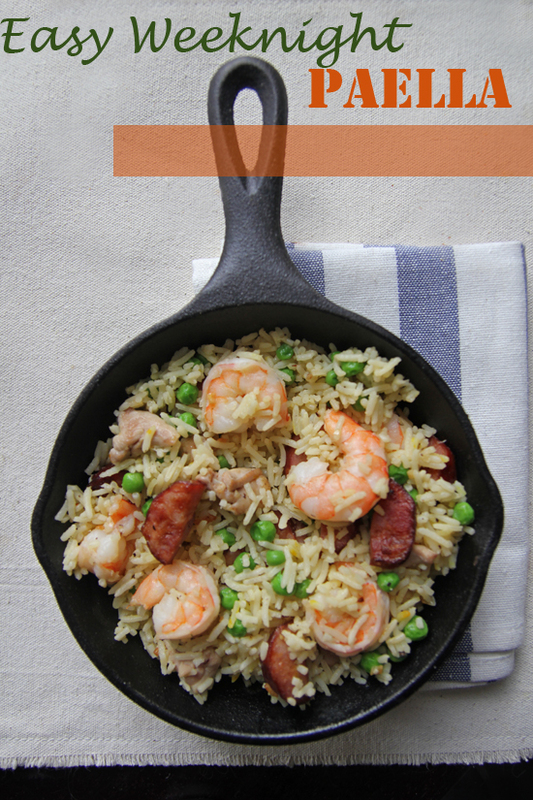 your weeknight paella looks like such a delicious dinner - it is definitely going on the menu this week! Jenn Kendall: Let me know what you think! Looks delicious! Love how you made something that takes so much time doable on a weekday! scrambledhendruit: How big is your pan? This recipe is definitely an easy introduction to the dish - let me know what you think! Years and years ago, my husband decided he absolutely wanted me to make paella and bugged me until I did. It was pretty good, but it was complicated and too much work. I haven't made it since. But your version is perfect and looks so delicious! Maybe paella will be on our table again! Thanks!